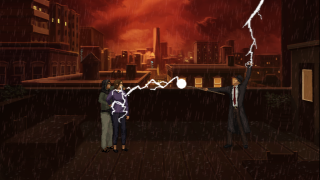 Wadjet Eye Games founder Dave Gilbert has announced on the Adventure Game Studio forums that his next project will be a dark, supernatural thriller called Unavowed. And unlike recent Wadjet Eye releases, this one is (mostly) all his: He said it's the first original game he's written in two years, and his first all-new IP since 2006. It can be confusing, because some of Wadjet Eye's best-known games—Gemini Rue, Primordia, Resonance, A Golden Wake, and most recently, Technobabylon—were actually developed by other studios. Its most recent release, Shardlight, was developed in-house, but according to Eurogamer was headed up by Francisco Gonzalez, who was the lead developer on A Golden Wake for Grundislav Games before joining Wadjet Eye. Unavowed will be Gilbert's work, with help from former Dragon Age writer Jennifer Hepler as story co-designer, plus art from Blackwell artist Ben Chandler, and music by Blackwell composer Thomas Regin. Players will be able to select a male or female lead character with one of three playable origin stories, and choose from five possible companions, each with unique talents and abilities. It will support twice the resolution of most Wadjet Eye games—VGA ahoy!—and offer “all the usual guff,” like voice acting, developer commentary, and all-original music.